Debi packed a great picnic lunch, George rented the boat (http://summerlandresorthotel.com/the-resort/boat-rentals) and we set off to explore Okanagan Lake on a hot sunny day at the end of June! George is an experienced boat operator but he still took the short course on how everything worked on this particular boat. We gals got to have the “queen for a day” experience of sitting back and pointing out the landmarks as well as just enjoying the sun and the water. We stopped off Rattlesnake Island (across from Peachland) and enjoyed our picnic of wine, cheese, crackers, veggies and dip and fruit. It was pure heaven! 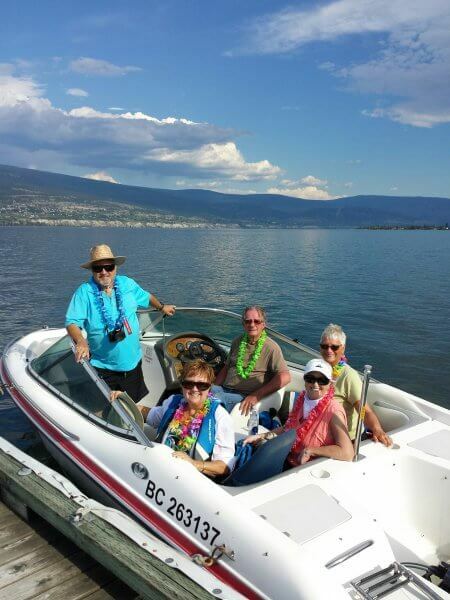 We then motored as far south as the beach in Penticton and back along the Naramata side of the Lake. Debi, being the prankster she is, also packed bottles of blowing bubbles for us to hold up as we motored. We three gals filled the air with bubbles, like kids on a lark! What fun!! We all wore leis for fun too. In all, 4 hours of pure summer enjoyment that I would highly recommend to anyone! Let us know if you are interested in doing this during your stay with us. We would be happy to book a rental for you!